This easternmost mound within the presently defined Cahokia mound group is a small rectangular or squarish platform mound just off the bank of Canteen Creek. There is some local discussion that this mound was built in recent times as a platform for a modern house. However, this does not appear to be the case, as the 1876 Patrick Map shows a roundish contour mound where the present Mound 1 is located. One can conclude that the present mound, although somewhat modified by recent construction, is the location of the original Mound 1. The base of the mound is approximately 129 meters above sea level (423.2 feet above sea level). The top elevation is about 129.8 meters (425.85 feet), making the mound 0.8 meters (2.6 feet) high. It is approximately 33 meters (108.3 feet) by 27 meters (88.6 feet) at the base and covers an area of approximately 800 square meters (0.20 acres). Until 1991, no excavations had been conducted on this mound; our only knowledge of it was from contour maps and its present appearance. 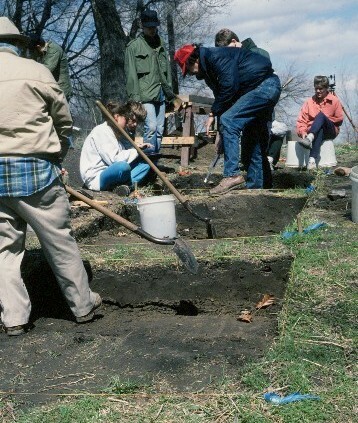 In 1991, Gayle Fritz, John Kelly, and Bill Iseminger conducted test excavations on the south side of Mound 1 with Fritz’s archaeology class from Washington University, personnel from the SIUE archaeology lab, and members of the Cahokia Archaeological Society and Cahokia Mounds Volunteers. A house that had been on the summit had been recently removed and a bulldozer had cut through the north side to remove debris from the basement. 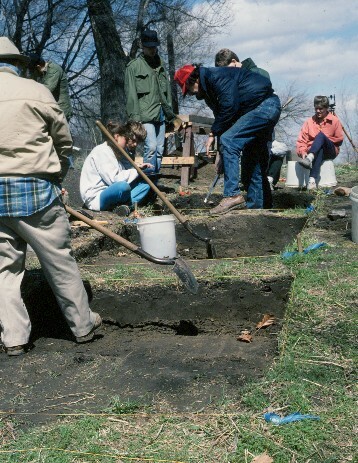 Excavation units were put into the south side, which was the least impacted side of the mound, just west of a concrete stairway and bushes that rose to the summit. The deep (up to 3 m.) units revealed that there was indeed some intact original mound beneath soil that had been added historically to elevate the mound for at least two house construction episodes. Basket loading was evident in the original mound fill and at least two construction stages. Zig-zagging mini step-like features at the interface between the initial mound fill and old surface suggest the surface had been prepared or raked with some type of tool, a conclusion supported by analysis by geomorphologist Bill Gartner. The base of the mound had been buried by slopewash and laminated alluvial deposits from the adjacent Canteen Creek. There were few diagnostic artifacts in good context to date the mound but a Stirling phase construction is possible.